Please call owner Phil at 415-740-6574. Boat Location: Sausalito, California. 2000 Cabo complete overhaul 2017-18. This includes state of the art 2017 (2) Volvo 330 diesel engines with electronic controls. New fiber glassed dash housing 2 12" state of the art Garmin displays for engine monitoring and GPS/Radar/Sonar. Control includes, cruise control, single lever operation, and slow speed for trolling (2.5-3.5knts). Transferable extended warranty included. 2 new radios 1 VHF 1 2 Meter. Generator. 2018 bottom taken down to gel goat with 4 coats of primer and 2 of finish bottom paint. Remainder of boat painted and sealed to rub rail (white) Awl Grip Paint. 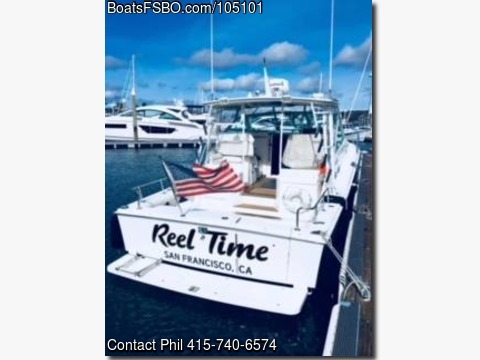 Boat maintained to highest standard and complete service records available. By the way, this boat catches fish. Beautiful Salon includes air conditioning, inverter, microwave, stove top. Stand up head 10 galloon tank. 50 gallon fresh water. 350 gallon fuel tank.